The ruling by the Supreme People’s Court of China in the antitrust suit brought by Qihoo 360 against Internet giant Tencent was the highest court’s first decision in an antitrust case under the country’s Antimonopoly Law, which went into effect in 2008. On Nov. 26 and 27, 2013, I provided expert testimony to the Supreme People’s Court in my (then) role as a Special Affiliated Consultant with Charles Rivers Associates. Here I provide views on the court’s ruling. This commentary was originally published by MLex. You can download a copy of the commentary here. I was asked by MLex to write a short commentary on the recent decision by the Supreme People’s Court, or SPC, of the People’s Republic of China regarding the litigation between Qihoo 360 (Qihoo, the plaintiff) and Tencent  (Tencent, the defendant). 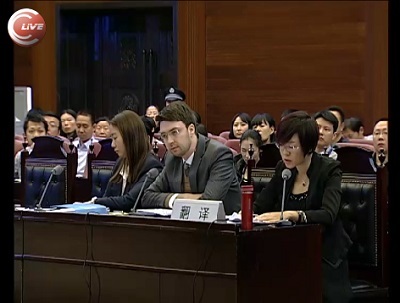 I was retained by Qihoo as an expert economic witness in both the original trial at the Higher People’s Court in Guangdong, and in the appeal at the SPC. While I no longer have any contractual or financial relationship with Qihoo, I evidently have some sympathy for their cause and this should be born in mind as you read this note. This note summarises the case and comments on two issues that were determinative to the Court’s conclusions: the appropriate use of data to assess dominance, and the application of antitrust to firms with multi-market contact. Both Tencent (current market capitalization in the region of $140 billion) and Qihoo (current market cap in the region $7 billion) are conglomerate software firms that offer a range of complementary online, desktop and mobile products. Tencent’s core products are the QQ Instant Messaging service, and, more recently, the WeChat mobile messaging service. Qihoo’s core product is the 360 security suite. By 2014, Tencent and Qihoo directly competed in a number of markets, including search and mobile app stores. In the second week of November 2010, Tencent enacted the “choose one from two” event that made all Tencent computer software incompatible with all Qihoo computer software, forcing consumers to choose to use software from just one of the two companies. Tencent communication at the time suggested the event was in response to the recent introduction by Qihoo of a downloadable advert blocker that prevented some Tencent products from showing pop-up adverts. Within 48 hours of the “choose one from two” event, Qihoo lost almost 10 percent of its installed user base. The event made international news, and the Chinese Ministry of Industry and Information Technology intervened to ask both companies to “take a step back.” Tencent reinstated compatibility with Qihoo software, and Qihoo removed its advert blocker from the market. At the time of the event, Tencent and Qihoo competed directly in the market for computer security services, and there is some evidence that Tencent considered Qihoo as a potential entrant into the instant messaging, or IM, market. In the years following the event, the two firms have competed directly in a number of other markets such as search and the distribution and monetization of games and other apps for mobile phones. The substantive issues of dispute were market definition, market shares, and abuse. The allegation of the plaintiff was that, by virtue of the QQ Instant Messaging product, Tencent was dominant in the IM market. Tencent then abused this dominance by substantially weakening the ability of Qihoo to compete in the computer security market, and the ability to potentially compete in the IM market or in any other markets where the two firms were likely to interact in the future. The Court broadly agreed with the Plaintiff’s market definition, calculation of market share, and general approach to assessing dominance. However, on analysis of the facts, the Court found that QQ was not dominant. Further, the Court found that the “choose one from two” event was not abusive, even if QQ were to be found dominant, since Tencent’s Computer Security product saw little benefit from the event, and Tencent produced no other product at the time that competed directly with Qihoo. I agree with the Court’s general approach to assessment of dominance, but disagree with its interpretation of the facts. I disagree with its general approach to assessing whether the event was abusive. The Court analysed seven factors when considering whether QQ was dominant: market share, nature of competition, the ability of Tencent to control prices or trading conditions, the technical and financial strength of Tencent, the extent to which QQ is a necessary service or product, ease of entry, and evidence of substitution. At first blush, these figures look compelling: in response to the decrease in QQ service quality caused by the “choose one from two” event, use of MSN increased by almost 62 percent. It appears to support the argument that QQ’s market position is fragile, and that any momentary decrease in product quality will be severely punished by the market. While a 62 percent increase in users sounds impressive, it is relatively meaningless without knowing the baseline. An increase of 62 percent from a base of 38 million users per month is not as compelling when you know that the market leader had 350 million users in the same month. All major IM services saw an increase in users during the month: it isn’t clear from these figures that QQ’s competitors can be thought of as winning business from QQ since QQ also had an increase in users that month. 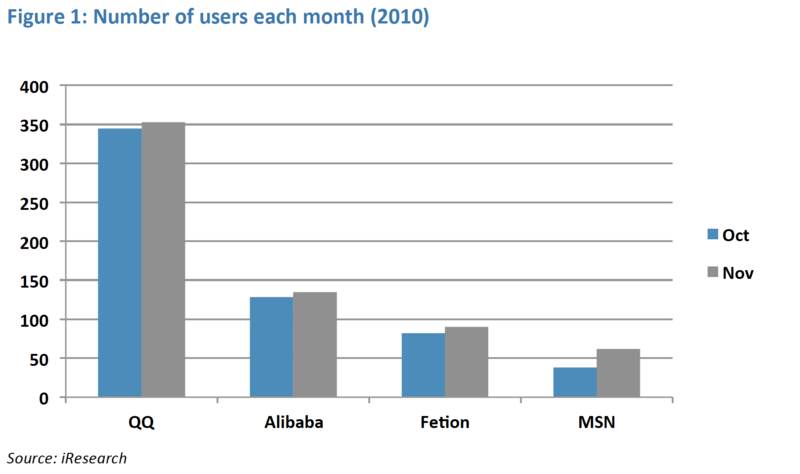 The number of users per month is a very blunt measure of market share. It would be more appropriate to show the total number of hours that users spent using the service, not least because hours of is most better correlated with revenue. 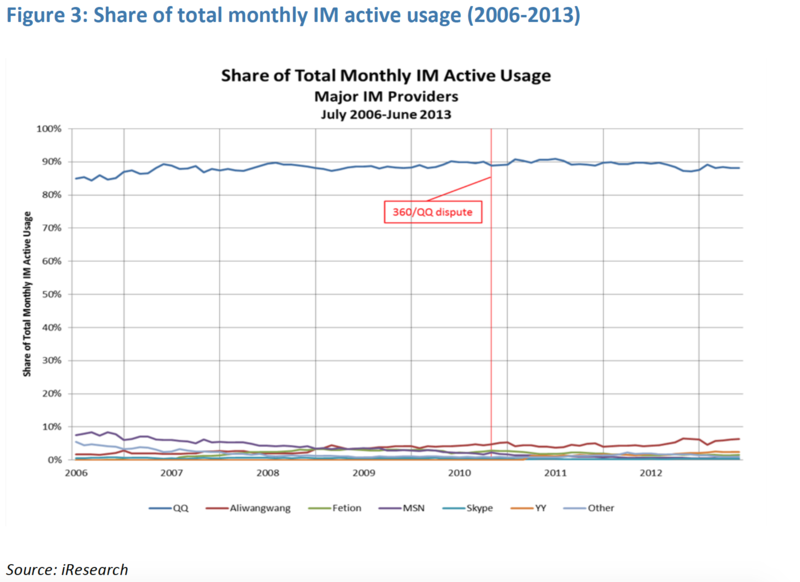 Usage of IM services shows significant variation from month to month. It is unclear whether the variations mentioned by the court were statistically significant. The first of these can easily be remedied by displaying the figures quoted by the Court in a graph. The 62 percent figure is immediately put in context: MSN user numbers increased during the month, but the increase was relatively small compared to the size of Tencent QQ’s userbase, which also increased. Presented in this way, it is a stretch to claim that the figures strongly suggest that QQ is not dominant. The other three issues can only be addressed by using a less blunt measure of consumer attention. In my analysis, I used weekly data of the number of total hours of use for each IM service. This is preferable to the monthly user number data that the Court relied on for four reasons. First, it is possible to create accurate market share figures from hours of use data by calculating a given IM service’s share of total hours of IM use. This accounts for changes in the overall variation of IM services in a given month, allowing for a better comparison of relative changes in popularity. Second, increased data frequency provides for more detailed analysis of impact, allowing us to better isolate the impact of the “choose one from two” event. Third, hours of use more directly reflects consumer usage intensity and can better capture fluctuations in popularity than the blunter user number data. 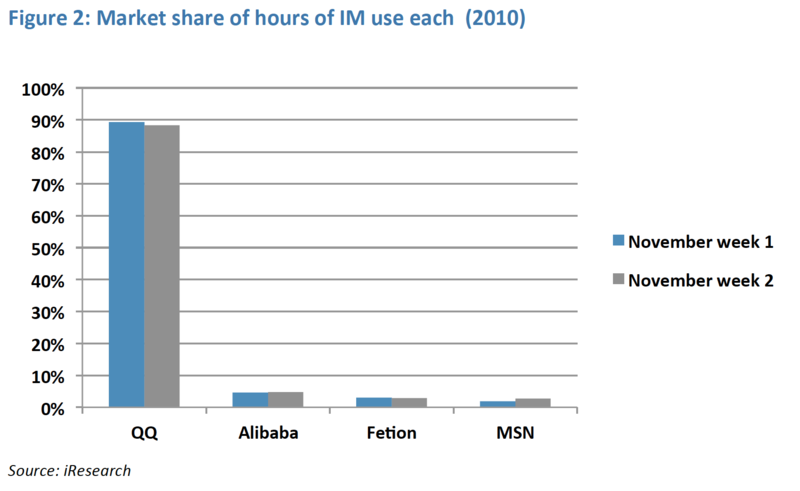 Finally, hours of use is more closely correlated with revenue than user umber, making it commercially more appropriate. Indeed, in its discussion of calculation of market share, the Court used shares derived from hours of use data, presumably because they thought it best described the relative position of the firms in question. Using hours use data converted into market shares, we can reproduce the previous graph to better understand the likely impact of the “choose one from two” event on QQ and its competitors. As can be seen, once the figures are presented as market shares, the impact of the event on actual use is far less striking. While MSN did see an increase in market share, it was from a very low base (1.9 percent) to an only slightly higher figure (2.7 percent). Indeed, the impact on both MSN and QQ was only just statistically significant at a 95 percent confidence interval, and the impact on firms other than QQ and MSN was statistically insignificant given the general noise in the data. I agree with the Court’s general approach to assessing dominance and its openness to considering evidence of how market shares change in response to changes in product quality. However, I disagree with where the Court has set the bar. I do not believe that a 0.8 percentage point increase in competitor market share in response to a substantial decrease in product quality strongly suggests that QQ, with a market share of close to 90 percent, is not dominant. I have similar concerns with the Court’s analysis of entry, which also contains statements of substantial percentage increases in the size of new entrants. Again, all of these increases are from a small base. As the graph below shows, by 2010, no entrant had been able to gain a market share in excess of 5 percent. In the three years between 2010 and the SPC hearing in 2013, the only IM service other than QQ that increased its market share was Aliwangwang, which operates in a distinct niche of communication between consumers and retailers on the Taobao online commerce platform, and in any case remained below 7 percent. Once more, I disagree with where the Court appears to have set the bar. While it is true that a number of firms have entered the IM market, and that market shares are not the be-all and end-all of market analysis, I do not believe that after 6 years of attempted competition, gaining market shares of 3 percent for a direct competitor, or 7 percent for a niche competitor, imply the kind of successful entry-at-scale that provides a meaningful competitive constraint on QQ. In addition, QQ’s market share over the period of entry remained constant. To a large extent the use of newer IM services appears to be at the expense of legacy IM services such as MSN, rather than at the expense of QQ. In assessing whether the “choose one from two” action could have been abusive were QQ to be dominant, the Court took a relatively literal approach to the law. The Court found that since Tencent’s security product did not materially benefit from the “choose one from two” action, and since Qihoo does not operate an IM network, competition was not distorted in either the IM or computer security markets. The harm to Qihoo’s user base is irrelevant, the Court found, since the objective of the law is to protect the competitive process, not competitors. Both Tencent and Qihoo have business models that involve using their core customer bases, in IM and security respectively, to branch out into complementary and more contestable markets. In 2014, for example, the two firms competed strongly in the provision of mobile games and online search. The “choose one from two” event hurt Qihoo in its core market of computer security, and thus must have reduced its ability to compete in other complementary markets. However, as noted, the Court did not engage with the possibility of Tencent and Qihoo competing in markets other than the two markets directly in question: IM and computer security. However, with connected and complementary products, such as those produced by conglomerate Internet firms, it is very plausible that a firm with power in one market (IM) could abuse that power to harm a competitor’s position in a second market (computer security) such that when the two firms compete in a third market (search), the competitor is at a disadvantage. Indeed, practices like this are discussed in the business literature as strategies of leverage or “envelopment,” and are increasingly important in complementary products where demand in one or more of the products exhibits strong network effects. I hope that the Court’s decision is not taken as a precedent that such multi-market contact and abuse is not covered by China’s Antimonopoly law. To do so would substantially reduce the scope of the law in constraining anticompetitive actions of dominant firms in online and other networked industries. Note: All data presented in this note is derived from the publicly available iResearch data set and was presented to the Court, in one form or another, during the trial. Sensitivity analysis was conducted to account for possible imperfections in the data, and none of the substantive statistical results changed.